This is a three day public seminar. "Sometimes the blessings of God are so down to earth that we overlook them." —Harold Klemp, The Slow Burning Love of God, p. 123. Read about Moses Mills, the Guest Speaker for this Seminar. Experience workshops, spiritual discussions, and other activities for greater spiritual growth. You may book your accommodation by clicking the button below. Please call these numbers if you need assistance: +233-302-519455 / +233-24-4845556 / +233-27-1042914 / +233-20-6690571. Download seminar flyer (3.8MB) [English]. 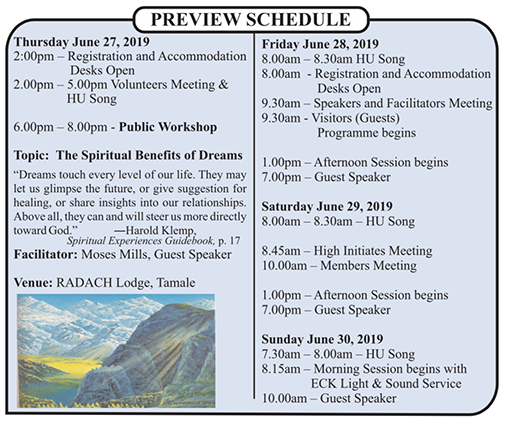 Presented by Eckankar Ghana Satsang Society, a Chartered Affiliate of ECKANKAR. For more information about ECKANKAR, The Path of Spiritual Freedom, visit the official main ECKANKAR Web site at www.eckankar.org or write to ECKANKAR, P.O. Box 2000, Chanhassen, MN 55317–2000 U.S.A. For technical comments regarding this Web site, please contact the Webmaster. Copyright © 2000-2019 ECKANKAR. All rights reserved. This copyright notice applies to this home page and all other pages of this Web site. The terms ECKANKAR, ECK, EK, MAHANTA, SOUL TRAVEL, and VAIRAGI, among others, are trademarks of ECKANKAR, P.O. Box 2000, Chanhassen, MN 55317–2000 U.S.A. The opinions expressed in this site are those of the writers and not necessarily those of ECKANKAR or the Mahanta, the Living ECK Master, Sri Harold Klemp.